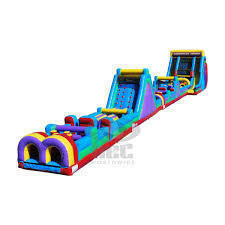 The Ultimate Obstacle course is a beast running over 130' feet long combining 4 of our great pieces the 30' the 40' the rock climb and slide and finish with the vertacle rush. This course weighs in at over 2000 lbs. and is sure to get the heart pumping by the time you finish so rent this one if you want to challenge the your friends to see who is the fastest around. The ultimate obstacle course comes with the generators to run it for the day so don't worry about all of the outlets, we provide the power.